We have got 54 of the UK’s finest ciders and perries all lined up for you to try at the Swansea Bay Beer and Cider Festival from 24-26 August at the Brangwyn Hall. Jo Bennett of the Pilot of Mumbles and her team on the cider bar have scoured the land to bring you the best tipples to be tasted. The popularity of the cider bar at the annual festival has grown in recent years and this year’s choices aim to satisfy the discerning palates of Swansea’s real cider drinkers. Please note, ciders and perrys are subject to alteration at the last minute. Ciders are also subject to availability and when they’re gone, they’re gone! S – sweet, M/S – medium sweet, M – medium, M/D – medium dry, D – dry. Proper stuff and jolly nice farm scrumpy! This fruity cider is based on the mill cider above, but with elderflower added. A sharp, sweet cider with good apple flavour – apple pie in a glass! Sweet and completely different. Fermented with Irn Bru so slightly orange! List compiled by Jo Bennett. 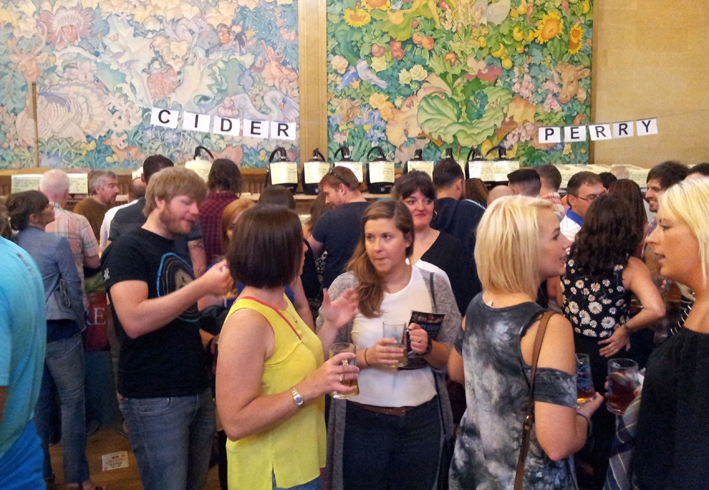 The cider bar at the Brangwyn Hall.